This article is about the city in Indonesia. For other uses, see Jayapura (disambiguation). Jayapura is the capital and largest city of the Indonesian province of Papua. It is situated on the island of New Guinea, on Yos Sudarso Bay (formerly known as Humboldt Bay). 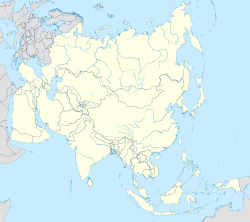 It covers an area of 935.92 km2 (361.36 sq mi), and borders Jayapura Regency to the west, Keerom Regency to the south, the nation of Papua New Guinea to the east, and the Pacific Ocean to the north. It had a population of 256,705 at the 2010 Census; the latest official estimate (as of January 2014) is 315,872. Jayapura is viewed from the top of the hill, Jayapura City sign, Coral beach, Love Lake (Danau Cinta) is a heart-shaped-lake located in Emfote (near Jayapura), the biggest mall in Jayapura (Mal Jayapura), Papua Trade Center (PTC), and Jayapura at night. Jayapura is the largest city in the Indonesian part of New Guinea. It is served by Sentani Airport, located near Lake Sentani. A highway connects the city to Skow, a small town near the border with Papua New Guinea and continues beyond the border to Vanimo. The government is currently planning to build a railway from Jayapura to Sarmi. Further plans could connect Jayapura with Manokwari and Sorong. The project is planned for completion by 2030. Jayapura is Sanskrit for "City of Victory" (जय jaya: "victory"; पुर pura: "city") and was named by Suharto as part of the de-Sukarnoization. The last battle against the Dutch was fought in the city in August 1962. Nowadays the Humboldt bay natives know the city as "Port Numbay". Upon these names, the city was known as "Hollandia". In 1945, the Dutch made Hollandia the capital of Netherlands New Guinea. After the territory was handed over to the United Nations Temporary Executive Authority, on 1 October 1962, the city went by a dual Dutch/Indonesian name: Hollandia/Kota Baru (New Town). When Indonesia took control over the city on 1 May 1963, it became solely Kota Baru. In 1964, the city was briefly renamed Sukarnapura, after then-President Sukarno, until the end of 1968, when it acquired its present name. Before its inclusion into the colonial government of the Dutch Indies, the location of present-day Jayapura was known as Numbay. Before the arrival of the Dutch there was an active trade in Numbay, centered on the Island of Metui Debi and the area where the former Gereja Pengharapan ("Church of the Favor of God") stood, in Sam Ratulangi Road, being most active between 1897 and 1905. The mode of the trade was through barter for spices, cassava, salted fish and bird-of-paradise. The society of Numbay was led by an ondoafi (chief of the tribe). In the 1800s, Numbay maintained relations with the Ternate Sultanate. On 28 September 1909 a detachment of the Dutch navy under Captain F.J.P. Sachse came ashore at Humboldt Bay near the mouth of the Numbay river. Their task was the systematic exploration of northern New Guinea and the search for a natural border between the Dutch and German spheres on New Guinea. Their camp along the river was called Kloofkamp, a name still in use as the name of an ancient district of Jayapura. Forty coconut trees were cut down for the establishment of the camp. They were bought from the owners at a cost of one rijksdaalder (national dollar) per palm. On 7 March 1910, the Dutch flag was raised and the settlement was named Hollandia. On the other side of the bay there was already a German camp, Germania-Huk (German Corner), which is now uninhabited and part of Indonesian territory. Hollandia was the capital of a district of the same name in the northeast of West New Guinea. The name Hollandia was used until 1962. The northern part of Netherlands New Guinea was occupied by Japanese forces in 1942. Allied forces drove out the Japanese after amphibious landings near Hollandia, from 21 April 1944 including Battle of Hollandia. The area served as General Douglas MacArthur's headquarters until the conquest of the Philippines in March 1945. Over twenty U.S. bases were established and half a million US personnel moved through the area. Jayapura was struck by the Aitape tsunami after the 1998 Papua New Guinea earthquake. The topography of Jayapura varies from valleys to hills, plateaus, and mountains up to 700 metres (2,300 ft) above sea level. Jayapura overlooks the Yos Sudarso Bay. Jayapura is about 94,000 hectares (230,000 acres) in area, and is divided into five districts. Around 30% of the area is inhabited, with the remainder consisting of a rough terrain, swamps, and protected forest. The average temperature is 29–31.8 °C (84.2–89.2 °F). As the capital of Papua Province with all the development undertaken, Jayapura City becomes a "magnet" for tribes from other regions of Indonesia. Ethnic Javanese, Makasar, Bugis, Toraja, Manado, Batak, Ambon, Madura and so on, among others ethnicities of the nation that helped increase the population drastically in at least one decade. In addition to the label "city of Education" then has made this city a destination residents from outside the city of Jayapura to find a job and also gain knowledge in several institutions in this city. On 12 May 1949, the Apostolic Prefecture of Hollandia was established in the city. In 1963, it was renamed as the Apostolic Vicariate of Kota Baru. In 1964, it was again renamed as the Apostolic Vicariate of Sukarnapura. It was promoted in 1966 as the Diocese of Sukarnapura, renamed in 1969 as the Diocese of Djajapura and since 1973 spelled as Diocese of Jayapura. The highest economic growth of Jayapura city compared to other districts/municipalities in the province of Papua has had implications for the increased income and purchasing power of the people. The economic growth is largely contributed from the tertiary sector, where trade and services and finance dominate its contribution to the formation of GRDP. The sharp gap/disparity of income, and the high rate of poverty (31.95%) and unemployment rate with labor force participation rate reached only 57.26%. Another weakness is the not yet optimal use of agriculture (in the broad sense) as one of the supporters of the regional economy that has a competitive advantage. Tourism developments, marked by the growing tourism industry and domestic and foreign tourist arrivals in Jayapura City, have provided opportunities for various sectors to flourish, especially income generation for the indigenous people of Port Numbay in Jayapura city. With the development of trade and service activities supported by the increasing availability of trade and service facilities that lead to increased private investment in the trade and tourism services sector and other sectors. This condition also needs to be supported by the protection policy for the indigenous people of Port Numbay to be prioritized in taking the opportunity to compete healthily, especially in the field of trade, investment and tourism sector. The economic condition of the indigenous people of Port Numbay, particularly in the context of economic competition in the city of Jayapura, is still at a low level with the lack of capital and skills possessed and with increasingly depleted natural resources. With the skills and knowledge that still rely on subsistence economic activities such as sago concocting activities, catching fish in the sea, shifting cultivation to indigenous people of Port Numbay, it is enough left behind with other ethnic in Jayapura city that competes in trade and service which is economic modern with profit from the subsistence economy. However, by utilizing the customary rights area along the coast that became the coastal tourist attraction, some of the inhabitants of Port Numbay Original have competed in the service sector even on a small scale and limited capital. This is done by indigenous villagers Kayu Batu on BaseG beach in North Jayapura, Hamadi beach in South Jayapura and on Holtekam beach, Skow Mabo and Skow in Muara Tami district. While competition in the field of trade is still limited to the natives of Port Numbay because it is still in small scale and is subsistence economy. Among other things, the sale of crops such as marine fish, long-term crops such as coconut, areca nut and others that more levels of economic competition with other ethnic Jayapura in the same merchandise, and with a larger scale. Jayapura is the home of the Persipura, a professional football club that has produced many famous Papuan-Indonesian footballers and have won the Indonesia Super League three times in the 2008–09, 2010–11 and the 2012–13 seasons. Persipura plays its home matches in the Mandala Stadium. ^ a b Biro Pusat Statistik, Jakarta, 2011. ^ In the spelling Sukarnapura, the ending "o" of Sukarno's name was replaced by an "a" to name the city after Sukarno in the Javanese, in which the "o" is pronounced [ɔ] but written with "a". ^ a b Fabio Maria Lopes Costa (5 June 2015). "Jelajah Sepeda Papua – Jayapura, Cahaya Dari Timur". Jelajah Sepeda Papua (in Indonesian). Jakarta: KOMPAS. KOMPAS. p. 24. Retrieved 6 June 2015. ^ "Jayapura". Encyclopædia Britannica Online. Retrieved 27 May 2010. ^ "The Impact of the 1998 Aitape Tsunami at Jayapura, Indonesia" (PDF). National Oceanic and Atmospheric Administration (NOAA). Retrieved 27 May 2010. ^ "weather of Indonesia Jayapura". ^ "Persipura Consistently to Develop Local Players". Papua Untuk Semua. Retrieved 27 July 2013. Wikimedia Commons has media related to Jayapura.